Four years later, SqueakyMonkey is more than just tees – Tiffany has created a whole line of Blythe couture – distressed denim jeans, fairytale dresses, tailored velvet coats, vinyl corsets and so much more. Tiffany is still a pioneer in Blythe fashion, merging cute and high fashion with confidence and flair like no other seamstress could, while always maintaining a unique fashion sense and style. Tiffany was able to do a little Q&A with us recently and shared her thoughts about all things Blythe. Tell us a bit about yourself (Name/Line Name/ Dolls you collect). Tiffany / aka tiff and squeakymonkey I collect primarily Blythe dolls. I have around 20 presently and a few other Japanese dolls and toys. Does your doll-style match your personal style? Not really. . I do make distressed jeans and tees and pair them with Momoko Doc Martens – that’s my style! 😉 My Blythe fashions are more of a creative outlet same as drawing, painting and photography have been. The clothing I create is a bit more dramatic than anything I would ever wear. Perhaps if I was 12 inches tall and my eyes changed colors at the pull of a string. I work very hard and long hours on SqueakyMonkey. I hate to make people wait for things – but, there is only one of me and I can only make so much. If only the girls could really sew! 😉 I honestly never dreamed I would be making doll clothes for a living. SqueakyMonkey can often times be more than a full time job. I do have the luxury of being able to dedicate myself full time because my career is freelance – so I am free to live the creative lifestyle. I am still working on finding balance with my other business ventures. Sure, it’s no fun churning out the same thing over and over again – but, I do feel it’s bringing joy to other people and that is very satisfying and that’s why I keep doing it. To keep from getting burned out – I slip in a new design while “slaving away in the sweatshop” and “voila” I’m as excited as I was the last time I came up with something new! How has Blythe, and crafting for Blythe, changed your life? My life is not the life I had before Blythe at all. It has changed immensely – too much to fit into this Q&A. 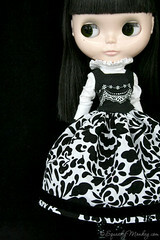 Before Blythe – I occasionally would make a pair of pants or something – but that was it. Although – I’ve always been into “making stuff” but, not that much sewing. I’m constantly learning and finding ways of making things better – I enjoy a good creative challenge. Right now Blythe is my creative outlet. I spend time with friends and family and with my dog, Osa. I am pretty serious about music and watch the Simpsons religiously… I’m also very interested in interior design and working on my apartment. My other “jobs” are freelance design and photography – which are both also creative… I am happy to live a creative life. Any tips/sage advice for a begining dolly seamstress/tailor just starting out? Not that I can think of… Just do it – don’t be afraid. Handmade clothes are the best! 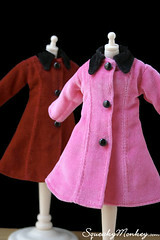 Especially the ones you make for your own dolls! That’s how I started. I had to get Goldie out of that awful gold jumpsuit! Thanks Tiffany for the great answers and great advice! Those of you who love seeing our darling Blythe in the spotlight – the July 2007 issue of Haute Doll magazine will have a SqueakyMonkey fashion spread with photos by Tiffany – look for them at a bookstore/newsstand near you very soon! thank you very much Lidna for another great spotlight. I really loved reading about Squeakymoney since IÂ´m a great SK fan ;). I canÂ´t believe itÂ´s being so long since we got our great tees and courdory pants. Something I love of Squeakymonkey is that everything is made from high quality materials and Tiff takes care of every single detail ^^. We are so lucky to have her. Tiff is definitely one of my inspirations from the early days! 😀 Thanks linda for helping us putting the spotlight on the dolly seamstresses around! ^O^! I love Tiff’s clothes. 🙂 I have the RotkÃ¤ppchen dress as well as some other smaller bits like tees and skirts, and they are all lovely. So yes, Tiff deserved to get this spotlight. Very well deserved Tiff, your tiny works of art never cease to amaze me. SqueakyMonkey rocks…….. so you go gal. thank you..thank you..for the information on Tiffany…Squeaky Monkey.. I am always amazed at her fashions…they are so detailed and interesting and CREATIVE… I am fairly new (4 months) to Blythe…and I am looking forward to getting one of Tiff’s fabulous fashions. Keep up the inspirational work! We are huge fans of squeakymonkey fashion! excellent article linda! Tiff raised the bar on finishing and tailoring a long time ago! I remember hearing her admit that she was picky about the way the stripes on socks lined up years ago, and until then I had never given it a thought. needless to say, my socks gotta line up now! Thanks for the great article on Tiffany! 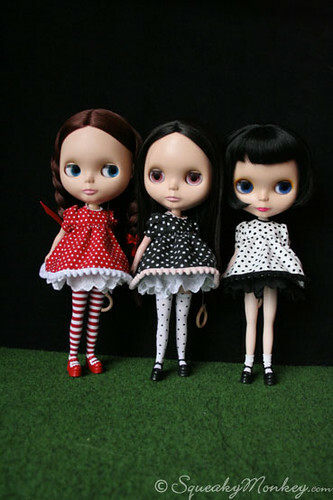 Tiffany is the first designer that I discovered when I first started collecting Blythes, one year ago today! I wanted something special for my girls to wear, and when I found Tiffany, I hit the jackpot! Her clothes are incredible! Every detail is perfected. When buying from her, you know the quality will be superior. That is not true about many of the doll clothes one sees online! I am so excited for her for being featured on your site and in an upcoming issue of Haute Doll. My girls and I are extremely thankful to Tiffany and her line of Squeaky Monkey Fashions! The girls feel really special when they are wearing one of her creations! One other thing…Tiffany also was so helpful to me when I was a newbie; she patiently explained any question that I had. I now feel lucky to count her as a friend! Awesome interview, Tiffany is the best! I adore the few Squeaky items I’ve managed to squirrel away for 😀 it’s wonderful to see her featured here. I was so excited to find Tiffany featured in this month’s Designer Spotlight! No one is more deserving nor talented in what she does! She puts her heart + soul into every piece of Squeaky clothing she makes and that is evident by her careful attention to detail and the fine quality of materials she uses. The quality is top notch! My girls have been wearing Tiff’s designs since I first discovered Squeaky Monkey last October and they can hardly be talked into wearing anything else! More than being a fantastic artist in many mediums, Tiff is truly a beautiful person inside and out with a heart of gold. I found a true friend in her and feel incredibly blessed to know her and call her my friend. Keep up the great work, Tiffany, we love you!! Tiffany’s new couture line is absolutely amazing! My girls are loving it! oh i love squeakyfashion! i’m so happy to see her here. Great article, I admire Squeakymonkey and love reading more about Tiffany and what she does. So inspiring! I love Squeakymonkey fashions…they are truly amazing. Tiffany deserves a lot of credit! Glad to see Squeakymonkey is in the spotlight. I admire Tiffany’s talent and Squeakymonkey’s style. She really has an eye for things! This is such a great article, Linda and Tiff! I have always loved the cleverness and details on Squeakymonkey designs, and it has been a pleasure buying a few choice items over the year – especially those tees! Love them!